Earlier this year, we spoke with Dr. Tilanka Chandrasekera, an assistant professor in the department of Design, Housing and Merchandising at Oklahoma State University, about the "virtuality-reality continuum" and its significance for design fields. 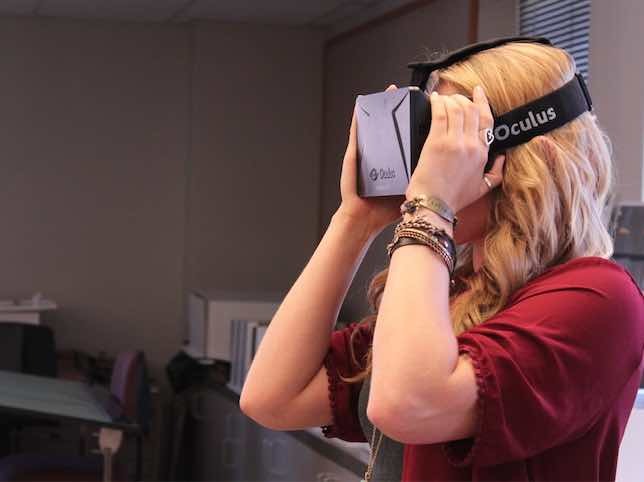 OSU opened a Mixed Reality Lab on campus in 2015, where design students can explore this continuum and experience the latest design tools in their field of interest. Today, we'll get an update from Chandrasekera on OSU's more recent expansion of the Mixed Reality Lab this past August and find out how the inclusion of mixed reality in the curriculum at OSU is impacting design students like Ashtyn Shugart. Mary Grush: OSU established its original Mixed Reality Lab fairly recently — in 2015. The campus has already expanded the lab — the new facility was ready for the opening of this academic year. Could you speak a bit about the lab as it is today — what tools we'll find there and how they are useful for design fields in general? Tilanka Chandrasekera: Since we started the lab in 2015, and since I spoke with you last, a lot has happened. 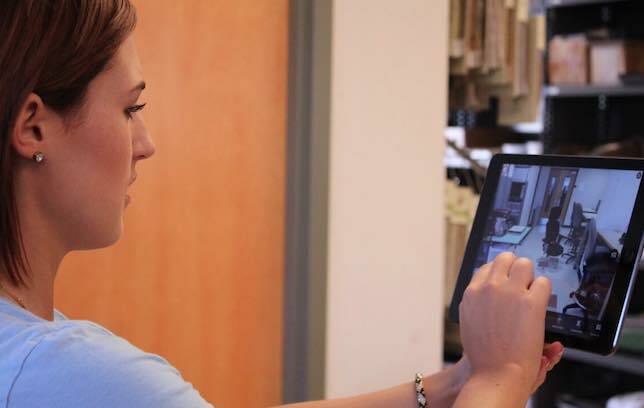 The department of Design, Housing and Merchandising, where the Interior Design program is housed, and the College of Human Sciences continue to believe in the need for providing access to cutting edge technology for students. The college and the department have been very supportive of our efforts in making this technology available to many more students and as well as researchers. So, we have moved to a larger space. The approximately 1,600-square-foot facility is specifically designed for this lab and allows us to cater to both our research and teaching needs. With the expansion we have provided several more designated Virtual Reality (VR) stations. We have incorporated additional technologies into the workflow, such as motion capture and eye tracking. Currently, with regard to VR, we have multiple head-mounted display sets of Oculus CV1s, DK2s, and DK1s; Razer OSVR headsets; HTC Vive head sets; and Samsung Gear VR. We also have a DepthQ Passive 3D VR setup: a projector-based VR system for collaborative VR projects. For Augmented Reality (AR), we have the Vuzix STAR 1200XLD AR HMD and the Epson Moverio AR HMD. We have funding for and are expecting the addition of a Microsoft HoloLens. 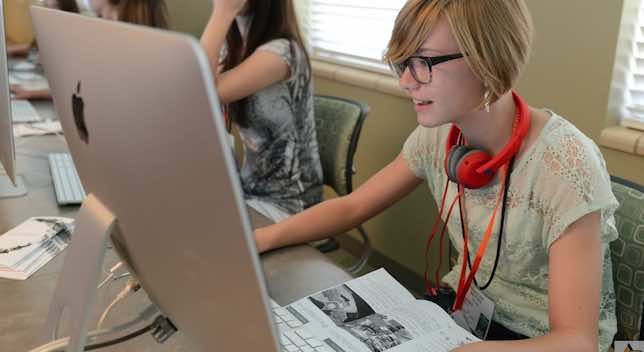 Apart from all that, we also connect our students to augmented reality via iPads and other tablets as well as various Web-based and mobile connections. And for prototyping, we have two 3D printers — an Ultimaker and a MakerBot. The Mixed Reality Lab is also partnering with "VR First", which is a collaborative network of VR-focused labs around the world — an effort organized by Crytek. Currently there are at least 16 labs in this initiative, including ours. We have begun to see a rise in demand for VR, AR, and 3D printing technologies in the design field, where companies are creating new job titles such as "VR Designer". The technology is approachable now. 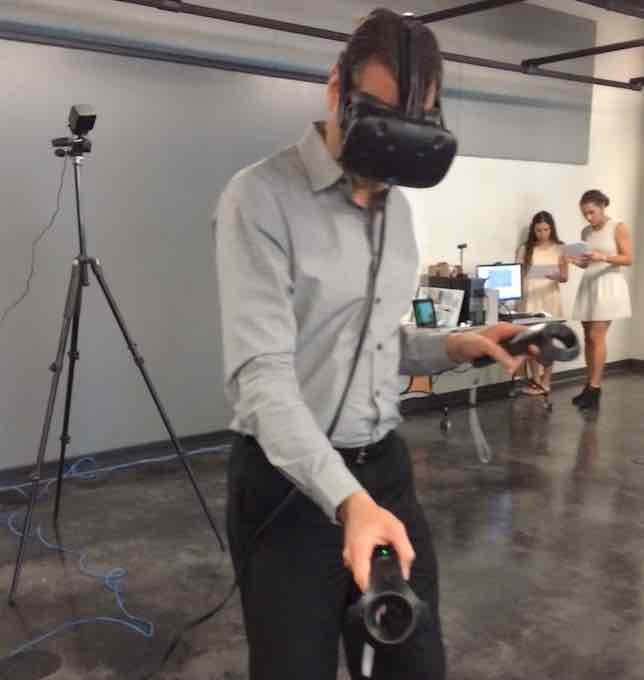 Big design firms such as Corgan have started using VR systems in their work. Especially when considering architecture and interior design environments, virtual and augmented spatial experiences allow professional designers to make interventions in the factors that affect the spatial quality of those spaces — before they are actually built. 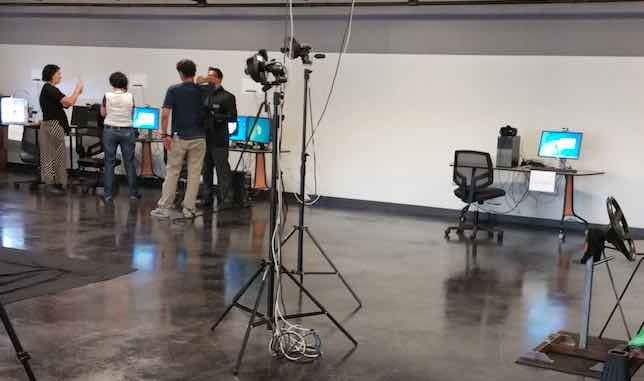 Grush: The Mixed Reality Lab is definitely expanding its offerings. Could you explain a little bit more about how OSU has incorporated the use of the lab's tools in the design curriculum? I'd like to find out how mixed reality is helping your students learn design skills and strategies. Chandrasekera: We have incorporated VR, AR, and 3D printing in most of our Interior Design studio programs. 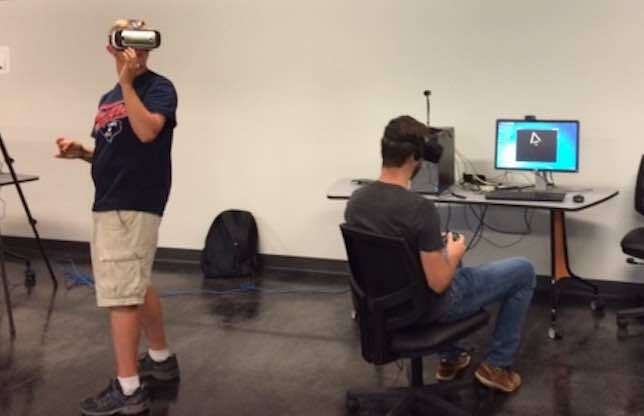 Students can use the VR stations to model a 3D environment with a simple software like SketchUp, and then use a gaming engine like Unity 3D or CryENGINE to simulate the space in VR — of course immersing themselves in that space through their headsets. For example, in one of my early design studios, students designed a dorm room and used VR to simulate that space. We have truly integrated VR into the design process. It is not just used to view the end result; VR is used as a creative design tool to modify different iterations of the design. The students are able to view and walk through the VR simulation and then make changes as they see fit. In another design studio project, students designed a piece of furniture and simulated the piece using AR. This allows the students as well as their reviewers to see how the piece of furniture looks in the real world. And, students can collaborate with others by trying out their furniture in a shared space. Still another design project required the students to create a 3D printed model of a piece of furniture. 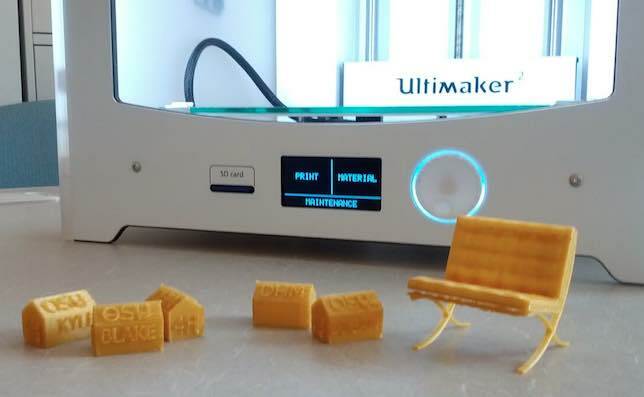 Students first used 3D modeling software to model the furniture piece, and then used the 3D printer to see if the piece worked in the real world. They could question, for example, whether the center of gravity was correctly placed, or if the furniture piece would topple over. We have also used simpler, inexpensive tools such as Google Cardboard with our students, working in programs such as Revit Architecture. The spaces they design can be viewed through Google Cardboard and their phones. This gives the students inexpensive tools to try out and incorporate VR into their design workflow. 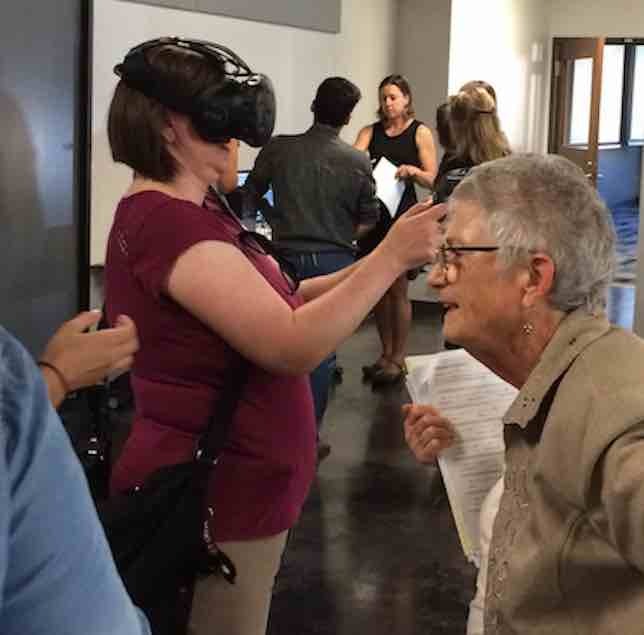 Apart from design studios and student projects, we have used these types of tools in our outreach programs — part of our land grant mission as a state university — such as the 4-H Roundup and Grandparent University, where we teach people in the community how to use tools like AR, VR, and 3D printing. Grush: Let's hear from one of your interior design students about her experiences in the lab and her thoughts on how valuable access to this lab has been for her. Ashtyn Shugart: I feel really lucky as an interior design student to have access to the Mixed Reality Lab. As a designer, a 3D reality view of what a space looks like is so much better than a 2D paper representation, where it is more difficult to understand how your design is going to play out and even more difficult to make adjustments when they are needed. When you have your VR headset on, you can readily test how your design will work in a space, and of course, you are all set to make changes if you find out that something is not working the way you expected. I was just introduced to 3D printing this semester. Of course, I had heard of it but never had the opportunity to use it before. I had designed a chair, but I didn't know whether or not it would actually function well in real life — especially, I wondered, would it fall over? After I had 3D printed it, I was able to tell just where the center of gravity was, so I could make sure it wasn't going to fail. And having a prototype, it was easy to explain things about the chair to other students I worked with in the design project. I think that as students having worked in the Mixed Reality Lab, we are going to have an edge — both in trying to find internships, and just knowing about the types of technologies we will be using at our design firms in the future. Also, the Mixed Reality Lab has helped me as I get started doing research. Another student and I have conducted a survey together on the design students' use of VR in the design process, and we are currently preparing a research poster to be submitted to a professional conference. Even though I have only used these technologies for a short time, I'm able to approach complex projects that would have been daunting with my previous 2D paper-based tools. It still takes a lot of work, of course, but getting started is much easier than I thought, and having tools to collaborate with other students helps keep our projects on track. Grush: The Mixed Reality Lab at OSU is still quite new. How soon do you expect to see graduates — who have used the lab as students — out in the "real world" in design fields? Will they be able to draw from their lab experiences as they approach their first years as professionals? Chandrasekera: I don't like to forecast, but I think it is safe to say that these types of technologies are useful in any profession, so lots of students will be potentially affected. Design students will be out in front of this movement — think about how designers work: They are very visual, and new digital technologies such as AR and VR help them visualize their designs easily, while convincing clients of their value as well. At this point we're not tracking specific students beyond their graduation, but there is some evidence of the long-term effects of student exposure to these tools. We have an internship program that students are required to take, and I believe that we might have some students applying for design positions specifically focused on designing in VR. Our students will have an advantage, because they will be familiar with not only what these tools are, but also with their place in the design workflow. Most companies will soon be using these tools in their workflows — if they don't already, they will within the next couple years. I'm so glad that we have the tools to prepare our students now. Grush: Of course, we expect change. How are you planning for change in the coming years, both for the lab and for mixed reality in OSU's curriculum? Chandrasekera: As well as continuing to expand our lab's capabilities, we hope to incorporate these technologies in our other design courses, and in other types of courses and disciplines across the campus. Even though as a lab we are relatively young, we have started collaborating across the campus with departments such as Human Development and Family Sciences, Graphic Design, Business, Mathematics, and others. We would like to reach out to more diverse departments and create ties with them. My colleagues who work with me at the Mixed Reality Lab, Dr. Aditya Jayadas and Dr. Greg Clare are from engineering and merchandising backgrounds, and this diversity helps in working with other departments. The workplace is becoming more and more collaborative in nature, and this is something that we want to embrace in the way that we teach and do research. For example, when Ashtyn goes into her profession, she will be working with people from various fields — engineers, graphic designers, architects, business leaders, contractors… There are many stakeholders in a project. 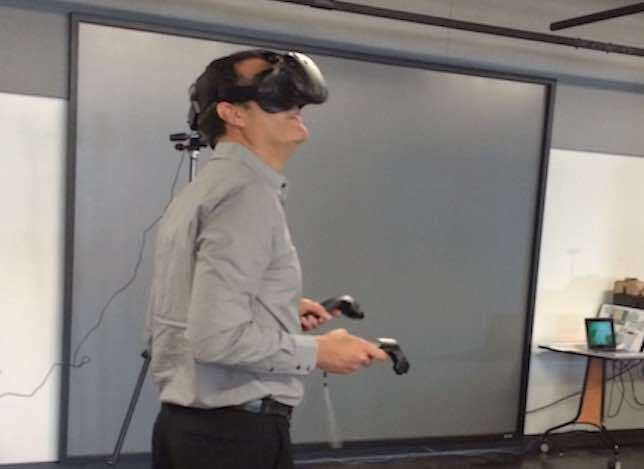 Forming these connections now, with other departments and disciplines through the common medium of VR, will help our students as they move into the real world to start tackling real problems. Our lab is not a traditional lab — it's very far from it. But the types of technologies that we promote and work with create a common ground for collaboration across the campus, departments, colleges, and disciplines. And this is the type of collaboration that ultimately supports our central goals of research, teaching, and outreach — as we prepare our students for the future.